Here is the StartUp screen. After setting up your events for the year, classes, and overalls, select a race and click Signup to get started. 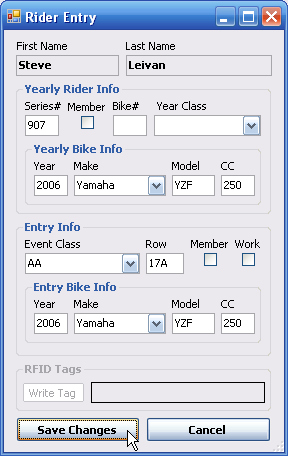 Here is the Rider Entry screen. After finding the rider in your database on the SignUp screen, you can then enter them in the event. 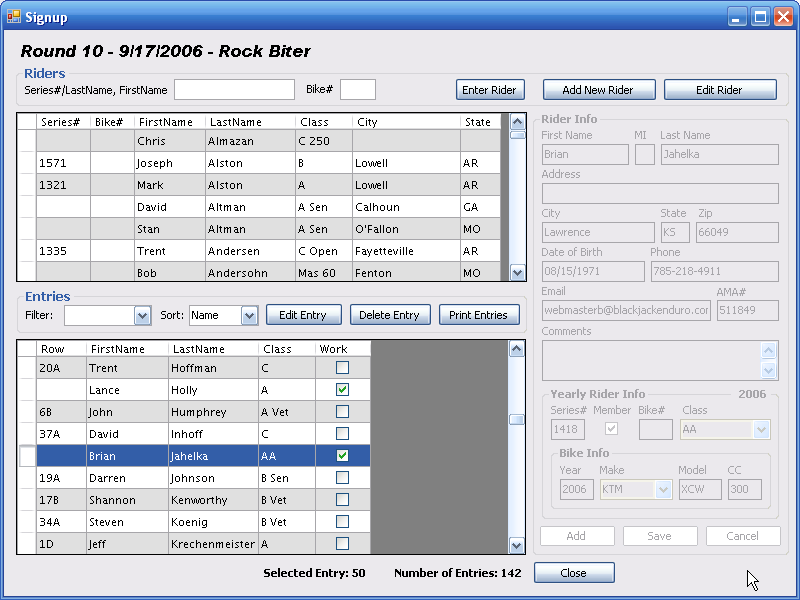 The more information you already have on the rider, the more information that is automagically filled out for you. Simply make sure they are entered in the right class and put them on a row and you are good to go. Here is the Enduro Scoring & Results screen. When the scorecards start coming in, simply type in their row number and hit enter to update their scorecard. 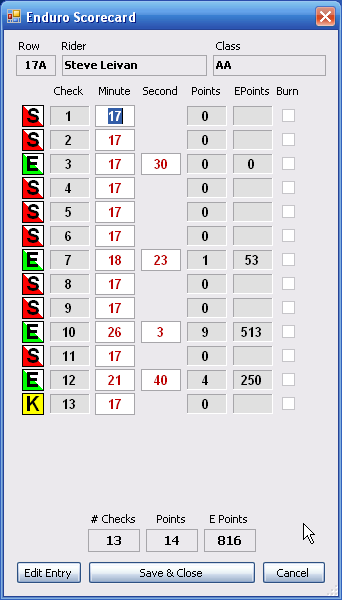 You can also double click a rider located in the grid to update the scorecard. Here is the Enduro Scorecard screen. Quite simply, just enter in the information verbatim off the scorecard using tab to get to the next field. Hitting enter saves the scorecard. I don't like for the user to rely too heavily on the mouse! Here is the Results Report Class Select screen. 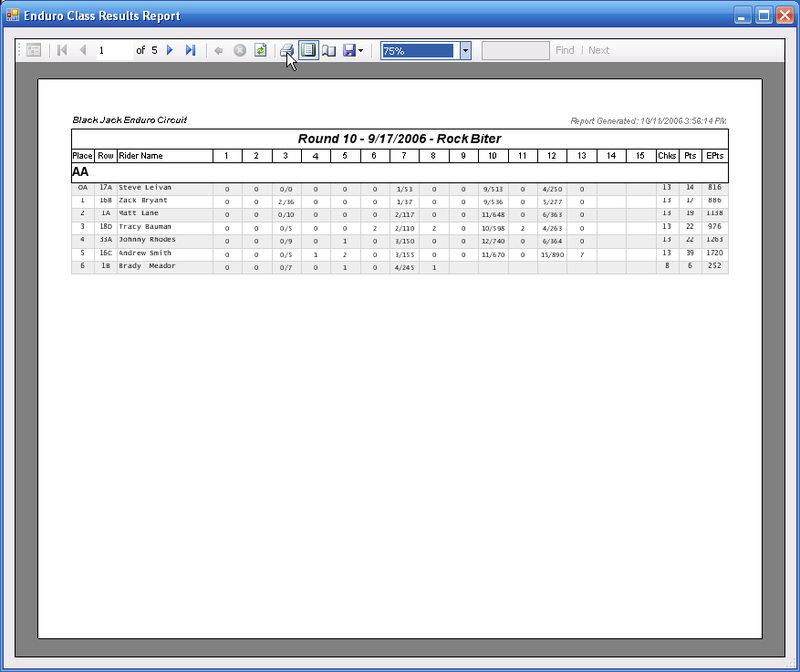 After all the scorecards are in and you are ready to print, click the Class Results Report button and you get this screen. 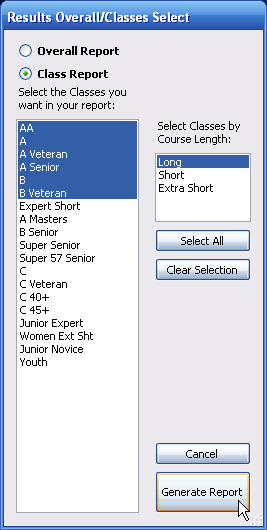 You can select the Overalls, or individual classes, or just long course classes, whatever. 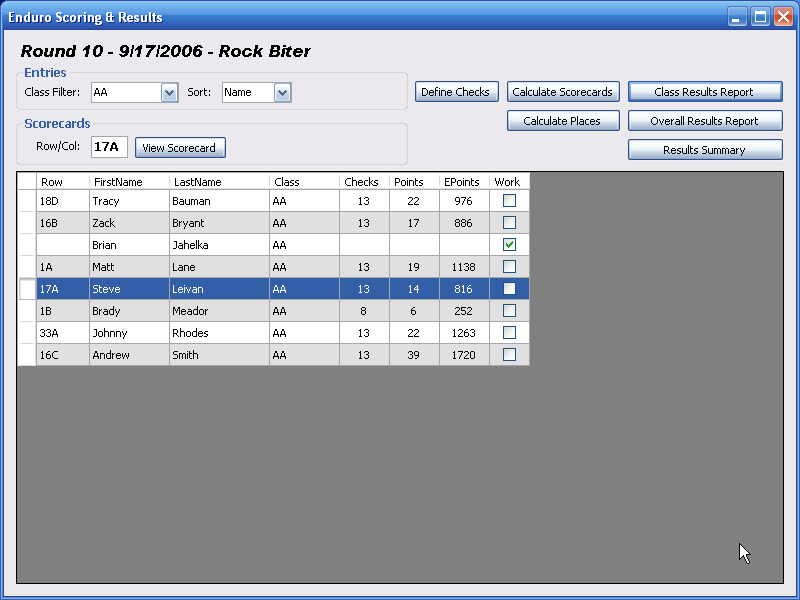 Click Generate Report and get your results ready for printing. Here is the Results Report. Notice that the placements take into account the Overall. This is great for handing out trophies and letting the rider know if they won an overall class. Not only can you print this report to your printer, but you can also export it to .pdf Acrobat or .xls Excel spreadsheet format! And now for the icing on the cake! ALL of this data is stored in ONE database. From the race site via cellular internet, or when you get home, simply upload the database to the webserver, and the results AND yearly standings are posted INSTANTLY! Check out any of the online results and see for yourself! Note: These are not static html pages like everyone else, these are real time dynamic pages with full user interaction that allows the rider to drill down and get all the nitty gritty detail they can stand!